The Faroe Islands are currently struggling to find their feet in a new context of globalisation and changing international requirements on fishery management best practices, as exemplified by United Nations protocols and agreements. We introduce the Faroese fisheries effort management system for cod, haddock and saithe, which represents an innovative attempt to tackle the challenges of mixed fisheries by means of a combination of total allowable effort implemented through days-at-sea and extensive use of closed or limited access areas. Subsequently, we present and discuss controversies concerning the system’s ability (or lack thereof) to achieve a level of fishing effort that produces long-term sustainability. Over the years the system has proved able to evolve and overcome challenges, and the Faroe Islands are currently considering adding a proper fisheries management plan to the system to achieve fishing at maximum sustainable yield. However, finding support for this plan presents a challenge due particularly to an enduring gap between the perspectives of scientists and actors in the catching sector. Finally, we outline some actions that could be taken to reduce the gap and hence facilitate reform of the system: 1) integration of the consultative/advisory process; 2) obtaining tailor-made advice for the Faroese effort management system from the relevant scientific body; 3) establishment of a transparent mechanism for monitoring and regulating fishing effort; 4) clarifying the efficacy of the prevalent system of closed areas. Fishing and fish processing have been the main sources of income for the Faroe Islands since the 1920s. The fisheries industry — including the catching and processing sectors, and a comparatively smaller but growing aquaculture sector — contributes roughly 20 per cent of the gross domestic product (MFNR ). Additionally, seafood related products represented over 94 per cent of the Faroese merchandise exports in 2012 (MFNR [2013a]). Close to being a `mono-product’ economy, the Faroese national economy to a large extent stands and falls with the fisheries industrya and is highly vulnerable to the volatility of catches and prices of the most important fish stocks (Búskaparráðið ). Populated by only about 48,000 people, the Faroe Islands are a self-governing territory within the Realm of Denmark with its own Faroese Home Government (FHG) and parliament (Løgtingið). Under the framework of the Home Rule Act of the Faroe Islands, powers are divided between the Faroe Islands and Denmark. The Faroe Islands decided not to join the European Union (EU) when Denmark did so in 1973. Thus, as fisheries management within the Faroese exclusive economic zone (EEZ) under the Home Rule Act remains the responsibility of the FHG, the Faroe Islands are not subject to the EU’s Common Fisheries Policy (CFP) (Statsministeriet ; MFNR ; SFI ). Traditionally, the most important fishery conducted in Faroese waters is the mixed demersal fishery targeting cod (Gadus morhua), haddock (Melanogrammus aeglifinus) and saithe (Pollachius virens) primarily on the Faroe Plateau and Faroe Bank. Between 1996 and about 2002, the mixed demersal fishery thrived and the Faroese gained a reputation for being near the forefront of fisheries management and sustainable fishing, due to a large extent to the performance of a new fisheries management system established in 1996 (Chuenpagdee and Alder ). Contrasting to the approach in most other European countries, the system implemented aims at controlling fishing effort (i.e. input control) rather than directly controlling the amounts of fish caught or landed (i.e. output control). Major advantages of the Faroe Islands’ effort-based system included resolving (by a landing requirement for all fish caught) the previously prevalent at-sea discarding of the unwanted bycatch of fish which was disliked by the fisheries industry, the relative simplicity of management administration of the new effort system compared with the previous output-based system and the major role of the catching sector in co-developing the new system (Jákupsstovu et al. ). However, in the last decade, various concerns have emerged concerning weaknesses in the Faroese system, including scientific advice not taken into account properly when deciding on the effort and fishing mortality applied to the target stocks; failure to set up a system for effectively monitoring fishing effort; lack of implemented fishery management plans (FMPs)/harvest control rules (HCRs); overcapacity, poor economic performance and profitability (Jákupsstovu et al. ; Christensen et al. ; Baudron et al. ; Búskaparráðið ; ICES ACOM [2012a]; Nielsen et al. ). The system is currently under heavy pressure, both nationally and internationally, to reform. Under the EU’s CFP, fish stocks are managed primarily by annual catch limits, i.e. output as total allowable catch (TAC) together with technical measures (Holden ). EU fisheries management, however, has been particularly impaired when using single-species TACs in mixed fisheries situations due to associated discarding at sea (Holden ; Daan ). Thus, TACs restrict the official landings but not the catch, such that the discrepancy between the two output measures may be substantial and difficult to determine accurately. In January 2014, the reformed CFP came into force, including a ban on discarding of fish together with a requirement for full catch accountability, as well as a legally binding commitment to fish sustainably according to the principle of maximum sustainable yield (MSY, i.e. the largest yield/catch that can be taken from a species’ stock over an indefinite period) in the context of multiannual FMPs (EU ). Having given a short introduction to the Faroe Islands’ context, we present the Faroese effort management system. We then discuss the system’s ability (or lack thereof) to sustain a level of fishing effort that produces long-term resource sustainability and the associated controversies and uncertainties around this. Finally, we explore how the Faroe Islands are attempting to move towards a fisheries management system along the lines of current international standards and provide some ideas on how the Faroe Islands can move forward. The current paper is primarily concerned with describing and diagnosing the Faroese fisheries management system with the aim of being able to offer advice on how the system could be reformed. However, the article could also be read in the context of some more generic debates in fisheries science. One such debate relates to the role of science in fisheries management and how science is fed into decision-making. In a relatively recent paper by several of the important scholars in the field in Europe, calls are made “for a more interactive system of producing a common knowledge base”, thereby changing the role of scientists from traditional `experts’ to `transparency experts’ assisting “stakeholders in trying to build an accurate common picture of the marine environment” (Schwach et al. : 803). The Faroese system offers a case of a system that adheres to a traditional approach that separates science and stakeholders (with the implications hereof) and is therefore a useful reference. In addition to the above, the Faroese case is also an example of an effort-based system. Effort-based systems are interesting not only because they are rarer than their TAC/quota-based counterparts but also because they are considered less bureaucratically cumbersome, which is of increasing interest as the economic importance of capture fisheries sector decreases. Furthermore, effort-based systems present an attractive fix to the notorious discards-problem, which has for instance been a major issue under the CFP. Currently, the EU is implementing a discard-ban in the TAC/quota-approach and there are few discussions on moving towards effort based management. However, in connection with the 2002/03 reform of the CFP effort management was considered as a serious alternative to the current TAC/quota-approach (e.g. Shepherd ). Similarly, only a few years ago the North Sea Regional Advisory Council was actively promoting an experiment with effort-management in the Kattegat. This was welcomed by the European Commission but never materialised (Fisheries Secretariat ). In exploring effort-management and the features that can possibly inspire TAC/quota-based approaches, the Faroe Islands remains the only `local’ inspiration for EU decision-makers. Publications on the Faroese effort management system were collected as part of a comprehensive literature review. A systematic approach was applied to conduct an electronic search of catalogues, bibliographies, and discriminating use of internet search engines. Relevant material sources (articles in peer-reviewed scientific journals or books, as well as grey literature) were read and new references identified through the citations. Having familiarised ourselves with Faroese fisheries management in general, and the effort management system in particular, we conducted a series of semi-structured interviews (average about 1½hours) predominantly with fisheries industry representatives (catching, processing, and fishery unions), fisheries managers and ecologists/biologists and social scientists associated with the mixed demersal fishery. Regarding the fisheries industry, we predominantly interviewed representatives from the catching sector, which is the sector most concerned with and vocal about fisheries management. It was not possible to identify any relevant representatives of environmental non-governmental organisations (ENGOs). A total of 17 individualsb were interviewed (in 11 interviews) during a field trip to the Faroe Islands in August 2012. The interviews followed a list of standardised questions/topics, prepared in advance, and took into account our literature review and our wish to learn more about the effort management system and its challenges. The interviews, which were recorded and subsequently transcribedc and organised by means of textual analysis software, served a dual purpose. On one hand the interviews filled in gaps in the factual knowledge on the Faroese effort management system obtained through the literature review. Equally important, however, the interviews uncovered controversies and different perceptions on issues related to the Faroese system. The respondents were granted anonymity and will only be identified by their affiliation with one of the stakeholder categories. For comparisons of the levels of fishing mortality (F) exerted on stocks of cod, haddock and saithe between 1987 and 2011, we used the Multiple Sample Comparison (MSC) procedure in the Statgraphics Centurion XVI Professional package (StatPoint Inc.). Tests were run to determine whether or not there are significant differences between the means, variances, and/or medians of the F values pertaining to these three stocks. In the MSC procedure, an analysis of means (ANOM) plot (Ott et al. ) displayed the sample means for each of the three stocks on a chart in order to easily determine which means are significantly different from the `grand’ mean for all stocks. While most governments around the North Atlantic adopted fisheries management based on TACs following the establishment of extended national fisheries jurisdictions in the mid-1970s, the Faroe Islands continued to manage the demersal fishery in their EEZ by means of traditional technical regulations, including application of minimum mesh sizes and closed areas. Thus, the Faroese regulations had the objective of controlling the catch composition, for instance by reducing the catch of juvenile fish, rather than constraining the volume of the catch (Gezelius [2008a]). It is not clear why the Faroese continued to apply the somewhat traditional approach while most other states moved `forward’. It is likely that a number of factors contributed to this. A licensing system for the demersal fishery was first implemented in 1987, thereby providing a means to regulate catch levels (Gezelius [2008a]). Thereafter, but before 1994, the demersal fishery in the Faroese EEZ was managed by a combination of license limits (curbing the number of fishing vessels), area restrictions for trawl fisheries (e.g. closed areas and seasons), minimum mesh sizes, and measures to protect juvenile fish (Maguire ; Jákupsstovu et al. ). To reduce F and recover declining stocks in the wake of a near collapse of the Faroese economy in 1992, a new TAC-based management system, implemented by means of individual transferrable quotas (ITQs), coupled with a discard ban, was introduced in 1994 when the Faroe Islands constructed its first, comprehensive legal framework for fisheries management, the Commercial Fisheries Act of 1994 (Løgtingið ). However, the ITQ system was abandoned after only two years, not only due to the substantial costs and administrative effort necessary for this management form, but also because it received considerable criticism and resistance from the catching sector (Gaard et al. ). It has also been argued that the TAC-system was in part forced upon the Faroe Islands by the Danish government (at least so it was perceived) as part of a package in which the Danish government helped solve the Faroese financial problems in 1992/93 (Gezelius [2008b]). This did not contribute to the perceived legitimacy of the new system. It is widely recognised that management by TACs of species caught in mixed fisheries — as the Faroese mixed demersal fishery — is problematic because the quota of different species may be exhausted at different rates. Thus, fishers face a dilemma when the quota for one species is exhausted: stop fishing and underutilise the quota for other species, or continue fishing and discard or illegally land over-quota fish (Daan ). With the latter option, the F level dictated by the TAC will be exceeded, and the scientific basis for stock assessment and future management advice will be compromised if the stock assessment is based only on official landings data, assuming that landings equal the catches (Kraak et al. ). In the Faroe Islands, the TAC-based system resulted in extensive discarding as well as under- and misreporting of substantial parts of the catch, related to bycatch problems that were increasingly difficult for fishers to handle, particularly when single species quotas had been used up (Maguire ; Jákupsstovu et al. ; Gezelius [2008a]; Johnsen and Eliasen ). The situation was exacerbated also by unusually low primary production on the Faroe Plateau ecosystem during the early 1990s, which subsequently had a devastating effect on the Faroese demersal fishery and society in the mid-1990s (Gaard et al. ). In response to the wide-reaching criticism of the TAC-based system, a general desire emerged to establish a new system that was easy to administer and enforce, and should remove incentives for discarding incidental catches, misreporting and black landings (Gezelius [2008a]). The chosen solution was a distinct Faroese management system focusing on the regulation of fishing effort rather than catches. The Faroese effort management system was implemented in 1996 after a short, joint design-effort between managers, scientists and key fisheries sector representatives (Jákupsstovu et al. ). This system has evolved somewhat over the years, but the main elements are still basically the same today. 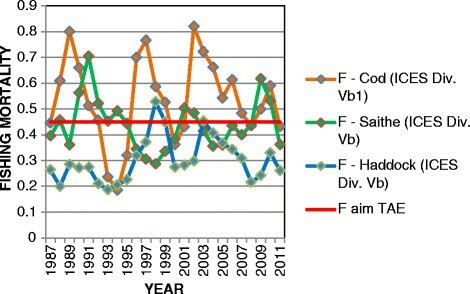 A fundamental objective of the Faroese effort management system is to regulate fishing effort so that the annual catch of the three most important demersal stocks (cod, haddock and saithe) does not exceed 33 per cent of the stocks, corresponding to controlling F at ≤ 0.45 on each of the three component stocks (Jákupsstovu et al. ). Beneath, based on available literature (Løkkegaard et al. ; Jákupsstovu et al. ; Gezelius [2008a]; Gezelius [2008b]; Christensen et al. ; Zableckis et al. 2009; Johnsen and Eliasen ; Løgtingið ; ICES NWWG ; DNV ), as well as our fact-finding fieldtrip to the Faroe Islands, the most important elements of the Faroese effort management system are described. Trawlers are generally not allowed to fish within the 12 nautical miles (nm) limit. In addition several other areas are closed to trawling either throughout the year or parts of it. Single trawlers under 400 horse power (HP) are given special licenses to target flatfish inside 12 nm with a bycatch allocation of 30 per cent cod and 10 per cent haddock. In addition, they must use sorting devices in their trawls in order to minimize bycatches. Capacity regulation aims to maintain fleet capacity at the 1997 level within each fleet group. It is taken for granted that the fleet capacity (fishing effort) is sustainable by not resulting in overfishing of the targeted stocks in the long-term. There are rules for allowing vessel transfers between groups (e.g. vessel replacement) and merging of capacity. The capacity policy is based on vessel licenses: a `harvesting licence’ attached to a specific vessel > 15 GRT, and a `fishing licence’ which allocates a certain number of fishing days in the EEZ and tonnes of fish outside the EEZ. The transferability of fishing days is restricted, and they cannot be transferred freely between gear and vessel categories. Maximum total effort expressed as fishing days (i.e. days-at-sea) is fixed annually for the coming fishing year (running from 1 September in one year to 31 August the next year) for each of the fleet groups and sub-groups. Excepting the artisanal fleet groups, the total effort is then allocated equally between individual vessels in each of the fleet groups. For the coastal fishery, 60 per cent of the total effort is allocated to full-time fishers who receive individual, equal-sized effort quotas. However, artisanal part-time fishers receive a common effort quota, i.e. not individually allocated, and their fishery is closed when the quota has been used. Fishing days may be traded within fleet groups and, with some restrictions, between groups. Fishing days can leased out for one year or sold permanently. Official effort conversion keys are used when trading effort between fleet groups in order to account for differences in fishing capacity across vessel sizes, engine power and gear types. Individual vessels can meet restrictions from effort limitation regulations by purchasing days-at-sea from other vessels. Thus, the effort management system effectively allocates individual transferrable fishing effort rights. The effort regulation is maintained through the fishing license system. An important characteristic of the Faroese regulatory regime is the comprehensive use of areas closed in certain periods of the year, as well as areas closed for certain types of fishing, in particular trawling. Such areas have been used since the establishment of the 200 nm Faroese EEZ in 1977. Initially the main purpose was to avoid gear conflicts between longline and trawl fishers, but it is now mainly used to regulate access rights to fishing areas. Additional uses of area closures — for the protection of aggregating adult fish on spawning grounds and juvenile fish in nursery and feeding grounds, limitation of bycatch, or the protection of vulnerable species and habitats — have played an increasing role in the case of temporary and seasonal closures. Up to about 1993, the extent and number of area closures in the EEZ gradually increased. Since about 1996 the closed areas have remained basically unchanged, with the exception of three new areas closed to trawling in 2005 to protect cold-water corals and additional area closures in 2011 within the 6 nm boundary. Additional technical measures span regulations regarding mesh sizes, obligatory, permitted or banned fishing gear, and bycatches. Specific minimum mesh size regulation and use of sorting grids are applied to particular fisheries. Use of beam trawls and Danish seine is banned. The general discard ban includes real-time rules for changing fishing areas when bycatch occurs, with obligations for reporting when bycatch levels reach 30 per cent of the catch under a certain size limit, and a system of minimum landing sizes for target species. In the context of discarding, all fish of commercial interest caught, including bycatch, must be retained onboard, landed and registered. Although the effort management system is a complex combination of rules and regulations intended to achieve the target catch as well as accommodating the interests of different fleet segments, the central decision-making with regards to the Faroese effort management system concerns the setting of the overall number of days-at-sea (an effort quota comparable to the overall catch quota in an output management system). This annual exercise starts when the Ministry of Fisheries and Natural Resources (MFNR) receives the annual report from the Faroe Marine Research Institute (FAMRI). This report is passed on to the Committee on Fishing Days (Fiskidaganevndin), appointed by the Minister, consisting of representatives from the catching sector as well as a chairman who is not from the sector. This committee drafts its own report based on the catching sector’s views and experiences. Building on FAMRI’s report and the committee’s report, the Minister drafts a proposal for the coming year’s fishing effort concerning the number of days-at-sea. The Minister’s proposal has tended to lie closer to the views of the committee than to those of FAMRI. The Minister’s proposed bill is evaluated by the Fisheries Advisory Council (Fiskivinnurádid, a council under the MFNR, which includes broader fisheries industry representation), concerning any potentially associated changes that may be needed to fisheries policy and legislation. 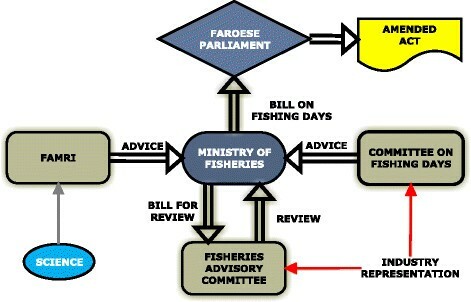 The Minister then presents the proposed bill to the Parliament, which makes the final decision and amends the Commercial Fisheries Act, see Figure 1. Flow chart for setting of the number of days-at-sea (Adapted from MFNR[2013b]). With the exception of FAMRI scientists, prior to the proposal’s submission to Parliament all stakeholders taking part formally in the process are from the fisheries industry. Thus, commercial fishing interests — especially from the catching sector ― have substantial influence on the decision-making process. The fisheries industry is organised into special interest associations (e.g. Ship-owners Association, Fishermen’s Union, Fish Processors Union, Association of Coastal Fishermen) and representation remains within these groups. ENGOs are absent from the process and even from the public debate, as indicated by our failure to find a representative to interview during our fieldtrip. On the other hand, the diverse fleet structure of segments and métiers results in a large variety and complexity of frequently differing interests in the catching-related representation. This complexity makes it difficult to gain agreement on effort cuts across different fleet fractions. As mentioned in several interviews, the process sketched above can be viewed as suboptimal as it provides little incentive or support for the integration of diverse views between scientists, managers and industry representatives. In particular, it `plays off’ the scientists against the industry and does not provide an effective forum for building understanding, trust and unification between these key actors. This leaves the politicians, in particular the Minister of Fisheries and Natural Resources, relatively free to determine the final decision between the frequently conflicting positions of the scientists and fisheries industry representatives. Whereas substantial progress has been made in the USA and in the EU in detaching politics from the fishery decision-making arena, due to the emergence of agreed rules-based FMPs (see later) and integrative stakeholder-based consultative forums (USA’s regional management councils; EU’s regional advisory councils) (Hartley and Robertson ; Ounanian and Hegland ), Faroese decision-making remains entrenched in a politicised, adversarial system. Notably, the absence of ENGO activity on the Faroe Islands may have contributed to the situation by pushing the scientists (more than their colleagues in for instance mainland Europe) towards a role as `issue advocates’ (i.e. protector of the fish) making them appear more as political actors than as `honest brokers’ (Pielke ). In the current section we explore the extent to which the Faroese management system can be considered biologically sustainable. Consequently, we are not looking into other measures of sustainability, i.e. social or economic. The Faroese effort management system enjoys considerable support from both the fisheries industry, particularly the catching sector, and wide parts of the general public (Jákupsstovu et al. ; Christensen et al. ). Criticism comes mainly from the scientific community, which argues that the level of fishing effort has for a long time been too high, thus exerting excessive F on the target stocks. The criticism is basically divided into two arguments: 1) the implementation of the effort management system is in breach of the relevant legislation, and 2) the legislation behind the effort management system is out of step with major international agreements and standards of best practice. The core argument related to the implementation of the effort system is that it produces F levels that are not in accord with the requirements. As mentioned, the Commercial Fisheries Act has a major objective of regulating fishing effort so that the annual catch of each of the three species does not exceed 33 per cent of the stocks in numbers, corresponding to an average annual F = 0.45 (Jákupsstovu et al. ). In Figure 2 the scientifically estimated F-levels for 1987 to 2011 for the three main demersal species from the International Council for the Exploration of the Sea (ICES) are presented. 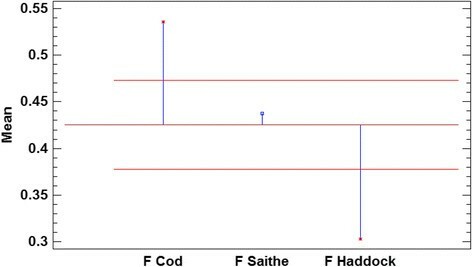 Variation in fishing mortality (F) for cod, saithe and haddock (Data from ICES ACOM[2012a]). The F levels of all the stocks have varied substantially both before and after the implementation of the effort management system in 1996 (Figure 2). Although allowing for occasional overshoots is implicit in the present system, the F-levels for cod, in particular, have been high compared to the 0.45 target. An analysis of means (AOM) plot (Figure 3) shows which means of the F values for the individual stocks are significantly different than the `grand mean’ of the F values for all the samples (i.e. all three stocks together). The grand mean for all three gadoids was 0.43 and cod (mean 0.54) and haddock (mean 0.30) had significantly different means than the grand mean, whereas saithe (mean 0.44) was not significantly different. Given that the Faroese effort management aims at an average (mean) F = 0.45, it is notable that there is no statistical difference between 0.45 and the grand mean (0.43) of F for the three gadoids in the period 1987 to 2011. This also applies for the period following 1996 when the effort management system was operational. Thus, the mean F for the `basket’ of gadoids (0.43) essentially has been in accord with the 0.45 aim of the effort management system as the 0.45 value falls within the upper and lower 95 per cent confidence limits of the plot. Of the `basket’ of gadoids, saithe falls within the 95 per cent confidence limits and haddock falls below the 95 per cent confidence limits thereby fulfilling the desire of the effort management system that F ≤ 0.45. As cod falls above the 95 per cent confidence limits, its F has significantly exceeded the management aim. Analysis of means plot for fishing mortality (F) levels of cod, saithe and haddock in the Faroese mixed fishery from 1987 to 2011. The central line shows the grand mean (0.43) for all three stocks, and upper and lower decision (95 per cent confidence) limits are shown at 0.47 and 0.38 respectively. The F levels in Figure 2 support Jákupsstovu et al.’s () conclusion that the objective of constraining the exploitation of the major demersal stocks by the effort management system, so that F ≤ 0.45 on each of the three component gadoids, has not been achieved. Thus, Faroese vessels have been fishing cod more intensively than the legislation stipulates. The 2002 Johannesburg Declaration of the World Summit on Sustainable Development (FAO ), especially Article IV.31(a) of the Implementation Plan calls for actions to “maintain or restore stocks to levels that can produce the maximum sustainable yield….”. The reiteration of the MSY approach from the Johannesburg Summit represented an extension to, rather than an abrupt change in, most national fishery policies (Lassen et al. ). These instruments call inter alia for stock sustainability, in the form of a MSY-based management and FMPs, consisting of stock and fishing intensity related reference points (benchmarks) and HCRs. In this regard, effective fishery management requires an understanding of how the fishery is performing relative to stock-related reference points; the most commonly used reference points relate to the stock size (biomass, B) and the levels of F that will result in changes in stock sizes, given various relationships between the stock, recruitment, natural mortality, and growth (Beddington et al. ). The FMP’s core contains the policy-related goal for fish stock management, expressed in terms of fishing mortality/effort and targeted stock size. The FMP presents an indication of the preferred balance between stock-related conservation concerns and yield (Lassen et al. ). Such FMPs encompass precautionary approach (PA) standards, related to the above UN policy instruments, in the form of `target’ and `limit’ reference points ― which are designed to account for risk/uncertainty and for keeping fishing within sustainable limits ― and recovery plans for stocks depleted beyond specified levels. The Guidelines in Annex 2 of the 1995 UN Fish Stocks Agreement outline inter alia that: a) a limit reference point (LRP) indicates a state of a fish stock/fishery that is considered undesirable, and a target reference point (TRP) indicates a state that is considered desirable as a management objective; b) a fish stock/fishery is anticipated to approach or fluctuate around a TRP, and should have a very low statistical probability of exceeding a LRP; c) TRPs are set to maximize yields (MSY) as a management objective, and should not be exceeded `on average’; d) It is anticipated that decision rules, such as HCRs, are established so that such reference points (i.e. LRPs, TRPs) shall be used to trigger pre-agreed conservation and management action; and e) recovery measures should be established for restoring stocks depleted beyond specified levels. The fundamental reference points for fisheries referred to in the above-mentioned international instruments are the biomass (BMSY) that can produce MSY resulting from fishing at FMSY over a long time. It is clear that allowable catches can deviate from MSY due to environmental and economic factors, interdependence of stocks, etc., but catch rates above MSY (i.e. > FMSY) are likely to result in declines below BMSY and lower catches in the long term (Froese et al. ). Thus, HCRs should adaptively and periodically (i.e. autonomously) adjust fishing effort (E), and thereby F, to sustainable levels reflecting the changing stock biomass. Having biologically-based MSY as a policy objective has an intuitive appeal because MSY implies efficiency and maximized revenues, and associated socio-economic benefits (Larkin et al. ). FMPs not only promote stock sustainability, but also form a key means for engaging diverse stakeholder participation in the knowledge production and dialogue process, which underpins FMP formulation (Hartley and Robertson ; Mackinson et al. ). In the USA, FMP development involves a standard federally-mandated public participation process involving scoping, public comment periods, hearings, etc. (Hartley and Robertson ). In the USA and the EU, regional fishery management councils and regional advisory councils, respectively, provide forums for stakeholder consultations and agreements on FMPs (Hartley and Robertson ; Hegland and Wilson ). Furthermore, the adoption of MSY-based FMPs, which are consistent with the PA, constrain the fishery to pre-agreed parameters, which anticipate that catch limits do not exceed the level specified in formal scientific advice. With catch limits `locked in’ empirically, there are sparse prospects to embark on politically-driven `decision-overfishing’ (sensu Aps and Lassen ) whereby fishing opportunities are set systematically higher than the scientific advice based on sustainable exploitation. Because FMPs should be robust and foster stock stability and yield, they are also called multiannual or long-term management plans (LTMPs). ICES is the intergovernmental marine science organisation, which provides fishery advice in the context of international agreements and addressing the policy and legal needs of ICES 20 member countries and the regional fishery management organizations (RFMOs), which they have established, around the North Atlantic and adjacent regional seas (Rozwadowski ; Lassen et al. ). Due to the influence of the UN fishery instruments, in 2009 ICES developed the MSY and PA framework for giving its future advice connected with LTMPs and HCRs (Lassen et al. ). The LTMPs, and their HCRs, result from political decisions at the national political and RFMO levels, and ICES currently provides advice according to such plans where they are found to be consistent with PA standards (Lassen et al. ). The advice has international legitimacy as it has been agreed in a committee of scientists which includes scientists appointed by all governments of the ICES member countries. It is notable that whereas Denmark, as an EU member state, has signed up to MSY-based management, the Faroe Islands have not. This reflects the latter’s fishery autonomy from Denmark and it not being within the EU. However, the Faroe Islands take part in ICES activities, including the ICES advisory process, and may request scientific advice from ICES based on an agreement between Denmark, the FHG and ICES (ICES ). ICES has estimated FMSY for Faroese cod (ICES Subdivision Vb1, the Faroe Plateau), haddock and saithe (in Division Vb comprising both the Faroe Plateau and the Faroe Bank) at 0.32, 0.25, and 0.28, respectively (ICES ACOM [2012a]). Thus, the F = 0.45 target for these stocks, as set out in the Faroese Commercial Fisheries Act, is much too high to fulfil the above-mentioned international standards. For many years, ICES has advised a number of different actions with regards to these Faroese stocks, all with the aim of substantially reducing the F-levels. The concerns of ICES and FAMRI regarding the excessive F exerted by Faroese vessels were relatively easy to ignore for the half dozen years of the effort management system while trends for landings as well as the spawning stock biomass of the three stocks were generally increasing. However, the trend has reversed over the last decade (ICES ACOM [2012a]). In particular the landings of haddock have plummeted, together with its biomass level falling below the LRP and recruitment being close to 40-year minimums, such that ICES has recommended instigating a recovery plan in 2013 with F = 0.15. The cod’s current status is not good either. The biomass of cod on the Faroe Bank is so low that fishing has essentially been stopped since 2009. The biomass of the Faroe Plateau cod has been below or near the LRP since 2006 and recruitment is close to a 40-year minimum, such that ICES has recommended instigating a recovery plan in 2013 with F = 0.20. Currently saithe is the only stock whose biomass is consistent with the PA as its spawning stock biomass is above the precautionary reference point (Bpa), but ICES considers nonetheless that it is harvested unsustainably (F > FMSY). The deteriorating situation of the Faroese demersal stocks has, over the last years, fuelled a debate on the reasons for this and even more importantly what to do to rectify it. At its core are various disagreements on the mechanisms of the effort management system. As noted earlier, the two opposing camps are — in the absence of ENGOs and in the presence of a politicised, adversarial decision-making system - in the Faroese context often the scientists and the catching sector. The role of scientists and the relationship and interface between science and management in fisheries is a topic that has attracted considerable scholarly attention lately, not least regarding studies of ICES and the CFP (e.g. Schwach et al. and Wilson ). Consequently, in addition to providing an insight into various controversies specific to the Faroe Islands, the following is also a study of the relationship between scientific rationalities and other rationalities. As described earlier, the number of fishing days for the coming fishing year is decided annually at the political level, in principle based on input from the scientists and the fisheries industry, mainly the catching sector in the latter case. Interestingly, the two advisory parties strongly disagree on the basic point of this exercise. The catching sector’s dominating perspective is that reductions in fishing days should, as a matter of principle, not be used as a response to fluctuations in fish stocks. Rather, cutting days should only happen in response to increased efficiency of the fleet (i.e. effort `creep’). The sector’s argument is that the Faroese fleet has traditionally always shifted its effort towards where the greatest fishing opportunities were. So if there were few cod, vessels targeted other, more abundant species, which is perfectly possible because of the absence of output quotas. The catching sector argues that the `automatic’ reallocation of effort towards the most abundant species, together with the large areas that are either completely closed for commercial fishing or closed for certain types of fishing, safeguards the stocks being driven to depletion: “We believe that we in this system have regulated so that we will never catch so large a share of the stocks that they will collapse” (Quote 1, fisheries industry, translated). Thus, the current low level of cod is, for significant parts of the fisheries industry, explained not by reference to overfishing but by changes in the natural environment. The catching sector finds support in the fact that massive cuts in fishing days have not resulted in improvements for the cod stock. Similarly, other fisheries industry respondents emphasise that there has been more or less consistent overfishing of the saithe stock when measured against the current PA and MSY reference points from ICES without this having led to a collapse of the stock; rather the industry representatives emphasize that the stock continues to be resilient and healthy. The above, combined with a much referred to failure by Faroese biologists to predict a swift recovery of the cod stock in the mid-1990s, has created a situation where the catching sector generally considers that the system is already essentially sustainable. Or at least that shifting to a system that is more directly based on stock assessments would not be considerably more biologically sustainable. Jákupsstovu et al. () emphasised that there was no evidence that fleets switch target species according to the relative abundance of all three species, which was one of the underlying assumptions of the effort management system. ICES also questions the mechanism of shifting effort, and has emphasised that for the Faroese effort system to work properly in a mixed fisheries context, the relative effort directed towards each species has to remain nearly constant, to ensure that the catches of each species are adapted to the abundance of each stock (ICES ACOM [2008a], ICES ACOM [2008b]). ICES noted additionally that the recent decline in the cod stock was associated with a marked increase in fishing mortality on cod, indicating that the management system has not functioned properly in that respect. In contrast to the catching sector, the ICES-related scientific community believes that the number of allocated fishing days (effort) must be linked to how stocks are fluctuating via the proposed FMP, which reflects international best practice. The basis for the linkage is to `hard-wire’ into the FMP the empirical relationship between effort and F so as to ensure that the effort level would be in accord with the principle of MSY (i.e. keeping the actual F ≤ FMSY and B ≥ BMSY). This reflects the scientific conviction that fishing pressure is a contributor to stock fluctuations, or at least that too high fishing pressure can have detrimental effects at low stock levels. This is, as mentioned above, not readily accepted by the catching sector, which highlights the closed areas in this regard and emphasises the uncertainty of nature and the complex interactions that the demersal stocks are perceived to be part of. When the effort management system was originally set up, one of the key issues was to decide on the initial number of fishing days. Since shortly after the start there has, however, been disagreement on whether the number first set was sustainable. From the scientific community’s perspective, one of the fundamental problems of the effort management system is that the number of days originally allocated was too high (Jákupsstovu et al. ; ICES NWWG ); too many days were distributed in order to get everybody onboard. However, in the following years, when the number of days should have been cut to better reflect the resource situation, there was no will for this. This created a conflict between FAMRI, which considered that the industry was violating a joint agreement, and the catching sector, which accused FAMRI for turning its back on the system it had originally partly designed. According to one industry respondent, the FAMRI scientists found themselves squeezed between loyalty to the agreement on the effort management system and loyalty to international colleagues in the ICES system. The latter were purportedly unable to understand/accept the Faroese effort system, which fundamentally differs from the TAC systems that ICES usually caters for. Based on our interviews with scientists, it appears that as ICES advice is basically geared towards TAC systems this has created a complicated situation for FAMRI scientists. They have to balance between a) the ICES system, which is not geared up to give targeted advice regarding the Faroese system, and b) domestic expectations which lack guidance on how to do this due to a dearth of clear domestic policy objectives and procedures. Each year fishing days remain unutilised by Faroese vessels. When exploitation rates are clearly under 100 per cent, which has been more common than not in several fleet segments (Zableckis et al. ; ICES NWWG ), one can infer that insufficient fish are available to sustain economically justifiable levels of catch per unit effort. So much the scientists and the catching sector agree on. However, the above disagreements on the need to link fishing days closer to the stock status, as well as on the sustainability of the initial level of fishing days, spill over into competing interpretations of what the presence of unused fishing days really means. To the scientists, the presence of unused fishing days demonstrates that the initial effort allocation was too high to constrain F, particularly for cod, and that too many available days remain in the system. So, fishing days should be removed to bring the effort level down to match the actual fishing opportunities. To the catching sector, the unused days are contrarily seen as indicating that the system is working: “This is the core of the system. If there are few fish, then we use few days; if there are many fish, we use many days” (Quote 6, fisheries industry). In addition, the catching sector has little hope that the number of days will be increased again after having been cut. That situation, of course, might result in more stable stock and catch levels, but stability does not seem to be a crucial objective of the sector when it fears that stability will be at a considerably lower level than the present average. The scientific community and the catching sector start from very different perspectives concerning the above disagreements. In current MSY-related fisheries management, self-regulation of fishing effort (E) occurs via the HCR which, as already noted, should adaptively and periodically (i.e. autonomously) adjust E, and thereby F, to the level necessary to achieve MSY as guided by scientific assessments informing on the status of the stock relative to established reference points. Thus, scientists see the Faroese effort management system as being unbalanced from the outset (i.e. excessive E and F due to too many fishing days) and furthermore unable to bring itself into balance due to the absence of dynamic self-regulation, i.e. the lack of a FMP containing a dynamically reactive HCR relating effort to stock fluctuations. However, the catching sector, views the system as being in balance from the start and also as able to deal, in a semi-automatic way, with imbalances that may arise. In our interviews, there were often references to this disagreement regarding the extent to which the effort management system can be considered partially or fully self-regulating. Meaning that it is an in-built feature that the system’s design prevents an application of a level of fishing pressure, on a particular stock, high enough to drive it to depletion or conversely that allows a stock at a low biomass level, due to human or naturally induced impacts, to recover to desired levels (not to be confused with the ongoing discussions of governance models resting on self-management/self-regulation by the fisheries industry; for examples, see Townsend et al. ). Compared with traditional TAC management systems, the Faroese industry is proud of operating what they perceive as a system in which there is little need to interfere as most adaptations (except for effort `creep’) occur automatically. As one respondent explained: “Even though you could say that if all fishing days were utilized, then the fishing pressure would be very high, it is not the case that all days are used. That is what you call a self-regulating system.” (Quote 8, fisheries administration, translated). Consequently, the catching sector generally argues that the presence of closed areas, which protect spawning areas and function as a stock refuge, in combination with economic incentives to shift effort towards the most abundant species in a system that is inherently in balance, ensures that stocks will not be driven to depletion. Consequently, although there are self-regulating mechanisms in the system, it is not clear how strong these are and this causes fundamental disagreement. Furthermore, the differences in interpretation of the sustainability of the original level of fishing days are important to have in mind when trying to understand the present situation. Finally, to understand the differences in perspectives it is also necessary to recall that the standard scientific models of ICES are generally not accepted across the board in the catching sector. The latter is generally skeptical towards the scientific community and specifically question whether the models are appropriate in the context of the Faroe Islands and the unique effort management system. A feature in the current setup of the effort management system, which seems to have reinforced the differences described above, is that the final decision on fishing days is taken at the political level, based on separate input from two sides: the biologists and the catching sector. As earlier noted, the decision-making system provides little incentive for integration of views (c.f. Figure 1). Thus, the two parties position themselves solidly in opposing camps. As one respondent put it: “It sort of becomes a trade-off. If you give in too much you risk losing ground” (Quote 10, outside observers, translated). As highlighted earlier, the Faroese effort management system could benefit from aligning itself with the previously mentioned UN policy instruments including adopting MSY-related management via LTMPs and HCRs in a PA approach (i.e. encompassing limit and precautionary reference points for fishing levels and stock biomass). However, the main issue regarding fisheries management in the Faroe Islands is not the effort management system itself, but rather its inability to adjust to scientific recommendations (emanating from ICES as the custodian of best practice) and to variability and trends in catchability (Baudron et al. ). This in turn is linked to the conviction that the initial effort was set too high by the Faroese decision-makers, and that it was not decreased sufficiently thereafter. It has been increasingly apparent in recent years that a major deficiency in the Faroese effort management system is the lack of a proper FMP, and especially the absence of related HCRs, for the demersal stocks (see also Anon. [2011a]). In response to this deficiency, as well as pressure to adopt MSY-related management by 2015 stemming from broad-based international accord from the 2002 Johannesburg Declaration (FAO ), in October 2011 a groupg appointed by the Faroese Minister of Fisheries and Natural Resources formulated a draft FMP, based on general MSY principles developed by ICES, for cod, haddock and saithe including HCRs (Anon. [2011b]; ICES NWWG ). The outcome currently awaits discussion and necessary approval at the political level (ICES ACOM [2012b]). The draft Faroese FMP (Anon. [2011b]) includes a proposal for a stepwise reduction of the fishing mortality of each of the three stocks to FMSY in 2015 and a recovery plan if the SSB declines below a `triggering’ level. Key MSY and PA parameters for the three stocks are mutually outlined by ICES (ICES ACOM [2012b]) and by the draft Faroese FMP (Anon. [2011b]). These plans in draft emerged as three, independent single species management plans, rather than a multispecies management plan. The multispecies management plan approach is necessitated because in mixed fisheries the single species objectives, concerning MSY and the PA, are difficult to meet simultaneously due to differences in dynamics and initial state of the various stocks. The approach in a mixed fishery is to manage on a `basket’ approach (e.g. the suite of targeted gadoids) where it is acknowledged that not all target stocks will be able to achieve either their own or a `pooled’ MSY target at the same time. In reality, the mixed fishery will be managed such that the various stocks which are in the `basket’ oscillate within a band as close as possible to the MSY target with respect to the exerted fishing effort, while ensuring that the biomass of individual stocks do not fall below their particular precautionary or limit reference points. Effort levels must be monitored credibly and periodically adjusted to compensate for effort `creep’ and achieve necessary optimization. A properly functioning management system should contribute towards autonomous regulation, i.e. adjusting effort and F to reflect changing stock status in MSY-related management, and ensuring that the market for trading fishing days works properly. For the Faroese mixed fishery, this would ideally entail hard-wiring the need for periodic increases or decreases in effort levels to the FMP, i.e. relating effort to fishing mortality and stock biomass as ascertained by stock assessments. The rights-based, tradable nature of the fishing days (i.e. an individual effort quota) provides for some autonomous adjustment, but the Faroese Council of Economic Advisers considers that restrictions on tradability limit its efficacy (Búskaparráðið ). The existence of excess effort/capacity in the Faroese mixed fishery results in the economic revenue generated being lower than when fishing sustainably (i.e. F ≤ FMSY, B ≥ BMSY). It is notable that the Australian Northern Prawn Fishery, which is an effort-based mixed fishery for several prawn species, systematically monitors and regulates the effort needed to achieve maximum economic yield (i.e. net economic returns) by adjusting the gear units (headrope length) (Kompas et al. ). Thus, effort in the Faroese context potentially may reflect not only fishing days but technical measures connected to fishing capacity such as hook numbers for long-liners and trawl openings – possibly modifying the extent of closed areas could enter the equation as well, reflecting the Faroese tradition for this. The fishing effort levels set for the `basket’ of stocks depends on how management wants to optimise the relative catch of the particular stocks. Agreeing on this, in the context of multispecies management plans, opens up for a complex debate not only on stock conservation but also on matters related to societal choice in a wider socio-economic context. Thus, there will be options and potential trade-offs in fishing opportunities as highlighted, for example, by recent ICES advice on mixed fisheries in the North Sea ICES ACOM [2012c]) underpinned by the Fleet Fishery Forecast framework (Ulrich et al. ). Informed decision-making depends on detailed and disaggregated knowledge of fleet/métier fishing behaviour in time and space, a feature currently monitored well in real time by the Faroese authorities. The Faroese FMP is currently in limbo in the political system and has not been embraced in the recent annual revision of the regulations. This is despite mounting pressure to reform the current system. It is likely that the Faroese reluctance to move forward with the plan(s) is due to the controversies which we have described. The Faroese effort management system does not currently live up to international best practice in fisheries management. In particular, the current system does not include a FMP, with associated HCRs, promoting autonomous effort management and thereby long-term stock sustainability in the form of MSY. Furthermore, the target F for cod, haddock and saithe enshrined in the legislation significantly exceeds that necessary to achieve MSY. Whether or not the above is a contributory factor to the current overall state of the Faroese demersal stocks is a matter of dispute between the industry and scientists. But scientists argue that the associated overfishing constitutes part of the explanation. Nonetheless, it is clear that — irrespective of its shortcomings — the system has several very appealing elements. As examples, the effort management system has curtailed the discards problem which blights many mixed fisheries. In addition, the system enjoys considerable support from the industry, which is essential in any fisheries management system. Further, the system exhibits great ingenuity in using targeted effort allocations and extensive use of closed areas to both balance and steer catches, and cater for the needs of diverse fleet segments. Thus, the exercise that the Faroese face, insofar that they wish to move towards updating their management system and reclaim their position at the forefront of fisheries management, is to adopt reform without jeopardising the positive elements of the system. A major problem regarding actually moving forward with a Faroese FMP in line with current scientific knowledge is the enduring and substantive incongruity between the perspectives of the catching sector and the scientific community. Based on our analysis, we therefor suggest that a necessary first step should be to work on reconciling the two camps. The following represent our suggestions on connected remedial actions which could be taken. As described earlier, there is currently little formalised integration between scientist and industry viewpoints. This reinforces the existence of divergent perspectives. Consequently, creating a more integrated (or `interactive’ (Schwach et al. )) advisory process and forums to consult and do business in could diminish this gap and thereby lead to increased collaboration and trust between the primary actors. This may already be on the way due to generational change and industry-scientist research cooperation. For inspiration, examples of such integration in the EU include the presentation of ICES advice by visiting scientists in the CFP’s stakeholder-led regional advisory councils, and these councils acting as the primary stakeholder forum for promoting agreement on FMPs, as well as the opening up of most ICES meetings to observers from for instance the industry. The Faroese authorities should officially request that ICES starts working on producing tailor-made advice for the Faroese management system. This would release the Faroese scientists from being stuck between `a rock and a hard place’ as `translators’ of ICES advice. This would in turn require full openness and transparency of all appropriate data necessary for monitoring and analyzing fishing effort. The context of the effort management system suggests that the Faroe Islands could become a valuable laboratory for advancing the management of mixed fisheries by using effort management and closed areas. For the Faroe Islands this concerns few stocks and there is a high degree of data availability on the stocks and the fleets. It is essential to develop a credible approach to measure and fully analyse fishing effort, including `effort creep’, in order to measure how much fishing effort/mortality changes over time in terms of fishing days. This should be possible due to the close monitoring of Faroese vessels and their relatively modest numbers. Peer reviewed data and conclusions on the status and trends of fishing effort deployment are essential, not least for developing models to relate fishing effort to fishing mortality. The latter relationship should eventually be `hard wired’ into the FMPs. Faroese scientists, working via appropriate ICES expert groups, should – in cooperation with the industry - intensify efforts to document and quantify the usefulness of various closed areas for particular purposes. This lack of documentation concerns the catching sector, which otherwise generally supports using closed areas in combination with effort management. Although the above actions would not in themselves make a reform of the core parts of the effort management system uncontroversial or easy, we believe that this would facilitate making the difficult decisions that lie ahead, not least in relation to the inevitable reduction of fishing pressure on the stocks that is required to achieve MSY-related best practices. The latter furthers both the long-term sustainability of the stocks and the fisheries industry. Taking action on the above, challenges scientists and the industry to collaborate in balancing conservation concerns and yield. aIn the following, the fisheries industry will generally be defined as consisting of the catching sector and the processing sector and not the aquaculture sector, although the latter is often included especially for statistical purposes. bMore specifically four scientists, seven industry representatives, three managers and three `outside observers’; the latter including persons who had been vocal in the debate on the effort management system but did not fit the other categories. cMost of the Faroe Islands interviews were conducted in Danish/Norwegian/Swedish. Whenever necessary (and indicated), the original quote has been translated to English by the authors. dAlthough managed through the effort management system, redfish are not usually caught in a mixed fishery with the remaining species. eThese conversion possibilities provide fishers with flexibility in selecting gear type to use/how to deploy their effort. fWe define fishery governance as the sum of the legal, social, economic and political arrangements used to manage the fishery. The establishment of institutions, legislation/policies, management plans and processes through which management may be realized at appropriate levels (e.g. national and local) is fundamental to effective fishery governance. Governance also concerns how power, knowledge and decision-making are shared amongst the key stakeholders. gThe group consisted of scientists from FAMRI, and one representative each from the MFNR, the University of the Faroe Islands, and the catching sector (trawlers). The research leading to these results received funding from the European Union Seventh Framework Programme (FP7/2007-2013) under grant agreement No. 289257. The funded project, MYFISH, deals with the issue of how to integrate the concept of MSY into the EU’s CFP (www.myfishproject.eu), and the research on the Faroe Islands was conducted as part of an effort to collect experiences from outside the EU. We are very grateful to our contacts on the Faroe Islands who took time to talk to us and inform us very openly about their fisheries system. In addition, three anonymous reviewers provided constructive proposals for improving the manuscript. We dedicate this paper to Douglas C. Kongshøj Wilson (IFM), our deceased friend and collaborator. He played a key role in proposing and designing the studies of best practices in fishery governance from which this work derives.